Several theories have been advanced to explain the sinister and dramatic Majimaji rebellion of 1905, which engulfed the entire southern half of the Deutsch-Ostafrika territory, then barely a decade old. Yet, none of those that have come to my notice seems to me to ring altogether true. For a start, the official German hypothesis of a planned conspiracy has been effectively demolished by R. M. Bell's excellent account (1950) of the nuclear outbreak; and indeed, common sense alone would render such a notion suspect, in view of the prevailing aftermath of a chaotic slaving and tribal-war era. The associated claim that Islamic elements were behind the revolt has more cogency, but here again my own researches on the spot show little more than connivance or subordinate participation on the part of local Muslims. True, the Ngindo instigators of the trouble embraced the Mohammedan faith along with the magic water (from which the movement derived its name 'Majimaji' or 'Water-water' in Kiswahili); but, even though by a paradox it is Islam which has persisted among the Ngindo tribe, initially the pagan Majimaji cult seems to have had the upper hand. The intriguing question of the degree to which Islam can be made responsible for the revolt is one which I intend to discuss in a separate essay. Another explanation, that of J. H. Driberg (1931), holds that Nubian mercenaries from the Sudan imported the idea of immunity from rifle fire conferred by mystic water. Whilst this is possible, the evidence that I shall bring in support of an indigenous water cult anterior to the German occupation makes it unlikely that the Nubians should have contributed much to the Majimaji unrest. If anything, their contribution would have been to arouse discontent through provocation, as they won evil fame for atrocities against the native population. This introduces the controversial hobby horse of German oppression, roundly condemned by Bell. Whilst I would not seek to defend the regime I am undecided about the alleged intolerable conditions in the area in question, namely Liwale, if only because the German personnel were too few in number and insufficiently mobile to mount a thoroughgoing reign of terror. Granted, the authorities were not popular; but this alone can scarcely account for the widespread and violent Majimaji reaction. In this connexion the Ngindo, who are by no means unintelligent, seem to have been well aware of the probable outcome of German defeat, that is, Ngoni resurgence; raiders of the Ngoni tribe, thought to be of Zulu extraction, had pulverized the region from Lake Nyasa right to the coast for more than a generation before the Germans took over. And there can be few who would opt for Ngoni frightfulness in preference to German discipline. However, the wizards who preached the Majimaji cause seemingly met this objection by promising to send wild beasts to drive any invaders back! and success in war' (Burton, I857, p. 88). Now, Bokero is the title commonly assigned to the originator of the Majimaji cult. In and around Liwale I myself always encountered the variant Bokera, but one has good authority (Bell) for the pronunciation Bokero. Eye witnesses of the rebellion speak of bogus seances held in a cave by this same Bokero, who was in addition associated with a pool called Ndagalala, said to be situated at the confluence of the Lihenge and Ngarambi rivers, some distance north of Liwale (Liwale District Book). People were attracted thither by the rumour that their ancestors, whose spoken answers to questions would be boomed through tunnels in the cavernourso ck,were to be seen reflected in the pool's surface. Actually Bokero is a term loosely applied to several witch-doctors who achieved prominence in launching the Majimaji campaign; and the primary Bokero's real name was Kinjiketire Ngwale. He was hung by the Germans in the early stages of the revolt. and Tastevin) contains no allusion whatever to any cave; and a German s oldier-official who spent years in Uluguru before the turn of the century, though he dwells on the 'wonderful mountains (' Von Prince), mentions neither cave nor shrine.The apparently complete absence of written corroboration or factual proof to bear out Burton's story leads me to suspect hat he may have been mistaken as to the scene of this earlier cult. His informants may have been speaking from hearsay probably through an interpreter and there is every likelihood that inaccuracies might occur. My own supposition is that, hearing of the mountainous surrounding of the sacred pool, Burton guessed the known Luguru range to be the locality his informants meant; whereas he would have no knowledge of the unexplored country lying to the south of the Rufiji. Neither Burton, who had already tried to do so without success nor any other explorer excepting the ill-fated Roscher and Von der Decken, had managed to penetrate the hinterland of Kilwa, to the south, owing to the hostility of the slave-traders. So nothing was known about mountains or any other geographical features southwards. In point of fact, the Matumbi region not far south of the Rufiji contains both caves and mountains. An article on the geology of the Rufiji basin (Stockley) includes a significant discussion of caves in the Mtumbei valley,a bout 30 miles inland from the port of Samanga. According to this source the principal cave thereabout Nsangoma, runs to truly gigantic size. 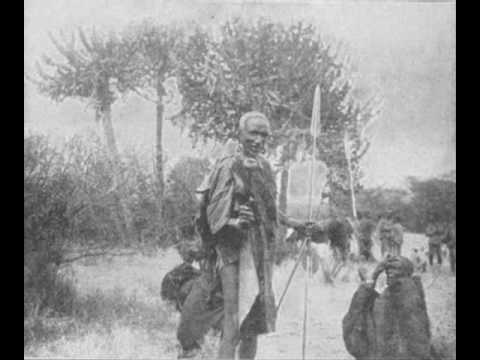 A Roman Catholic priest from the nearby Kipatimu mission, Father Ambrosius Mayer, visited Nangoma shortly after its discoveryby the authorities in 1910. He estimated that 5,000 people could have camped unseen in its 'enormousv estibule(' ibid.) where he found the traces of numerous earth fires. This then, would seem to account for the local reports of villages mysteriously deserted during the Majimaji operations. Another feature of Nangoma cave which Father Ambrosius noticed makes the analogy with Burton's account startling namely' an unruffled still pool of water which appeared to be of considerable depth'( ibid.). A. successor at the Kipatimu mission, Father Hilmar, who contributes a section on this subject to form part of Stockley's article, observes: 'the natives state that this stream never dries up even in the driest dry season.' Further he specifically declares that the Majimaji subversion 'originated from this place,' though unfortunately without giving details or citing the grounds for his assertion. One cannot therefore be certain that the rebellion did have its genesis at Nangoma. Nevertheless from the foregoing, a strong presumption exists that the original magic water, or perhaps simply the idea of magic water, emanated from it. Also, the evidence from Ngindo survivors of the revolt points consistently to Ngarambi (Ruhingo), like Mtumbei a part of Matumbiland, as the heartland focus of Majimaji propaganda; note that the Ndagalala pool at Ngarambi, mentioned earlier, is stated to be surmounted by a hill called Bwengi (Liwale District Book). Inevitably, some confusion has arisen in the recounting of these almost legendary events, but all the versions volunteered to me by local inhabitants agree in placing the origin in that general vicinity. For instance Ngameya, the witch-doctor who assumed Bokero's mantle and wielded the greatest influence during the victorious phase of the militant cult, operated in the Kitope area of Matumbiland. An old map of the Rufiji (Beardall) marks 'Kitopi Hill' no great distance inland from Samanga, i.e. to the east of present-day Kitope; and one is tempted to think that this individual lived fairly near to Nangoma cave and had access to it; certainly the home of Bokero himself, to whom Ngameya was related by marriage, lay close by at Ngarambi. Once the Majimaji conflict had broken out in earnest, Ngameya transferred his headquarters to another hill farther to the west, Nandanga; and it was to Nandanga that almost all the 'pilgrims' whom I interviewed went in search of 'the water.' Minority opinion favours a source on the Rufiji river itself at Mpanga (Bell), not far from which a water spirit called Nyangumi (literally 'whale' in Kiswahili) was thought to haunt the Pangani rapids. It is curious that Bokero's younger brother, Njugumaina Ngwale, should have adopted the title 'Nyangumi' (ibid. ), and that one authority should have regarded Nyangumi as the prime mover in the revolt . . . the people allegedly believed that 'a great medicine man lived in the Rufiji river in the form of a water monster, and that this supernaturalc reaturec ould dispense medicine' (Sayers). Evidently, like the other sources of magic water, Mpanga has its characteristic hill; for Beardall (1881), surveying the Rufiji for the Sultan of Zanzibar in i 88o, claims to have climbed it.The truth may be that, as the revolt developed, the distributing centres for magic water multiplied and spread far afield; thus in central Liwale it is said that a container filled initially at Ngarambi could be replenished anywhere in Ngindoland. Moreover, Ngindo cynics of today invariably ascribe the entire rebellion to the greed of the witch-doctors, intent on amassing more and more wealth from the lucrative fees charged for the magic water! Hence the birthplace of the revolt can be taken to be somewhere in the Matumbi area immediately south of the Rufiji river, most probably at Nangoma cave itself. Furthermore the historical material which I quote indicates the probable existence of a water cult at Nangoma at least half-a-century before the Majimaji upheaval. My tentative reconstruction of the cult's evolution is this. For a lengthy period, perhaps even for centuries, the awesome setting of Nangoma had given rise to mystical beliefs associated with water. Though widely known, as the allusion to 'distant Wazaramo pilgrims' shows (Burton; the Zaramo then occupied the Dar es Salaam coast and its nearby hinterland, much as they do now), the water's magical properties seem to have been mainly peaceable until the opening years of the present century; Burton does mention success in war as one of its attributes, but the sort of irregular skirmishing of the time between minor tribal segments, set against a background of sporadic and disruptive slave raiding, lacked the systematic character of true warfare; in Burton's day the wholesale pillage and slaughter of the Ngoni raids from the west had yet to impinge seriously on the coastal belt. Whilst the German occupation put an end to this instability, considerable tensions remained unresolved. The rancour of the Islamic coast, expressed in the formidable Bushiri rising of 1888 which had all but annihilated the German chartered company and had prompted direct imperial intervention, still lingered; and the authorities had been obliged to put down a whole series of local outbreaks in the turbulent interior, notably in the desperately fought Hehe campaign of 1890 to I894. Any general appeal to violence would therefore have found support in a number of apparently disparate quarters. Just such a general appeal to violence, as yet latent, existed ready-made at Nangoma. Though the first reported incidents in the Majimaji rebellion occurred at Samanga and Kibata, in the vicinity of Nangoma (Bell), not a few of my Ngindo informants consider that the water cult had next to no warlike content before the advent of Abdalla Mpanda, the most ferocious of the rebel leaders in Liwale, who is alleged by them to have twisted a largely neutral panacea in to a 'war of liberation,' using the threat of reporting the local headmen to Liwale boma for failing to give warning of the impending onslaught. Whilst this is manifestly an exaggeration, there are grounds for believing that the movement was not in the least aggressive in its inception; it is noteworthy that according to Bell's chronology Kinjiketire Ngwale, the prototype Bokero, was already in his grave ten days before Liwale boma foundered. Rather, it was only by degrees, and aided by bureaucratic inaction on the part of the imperial German government, that the revolutionary elements gained the upper hand. Perhaps the shift of Ngameya's base to Nandanga hill marked the decisive swing to a belligerent policy; for it was from this centre that for the first time the Majimaji armies' took the field. Henceforth the contagion of Majimaji defiance spread rapidly, until the feeble detonation of Nangoma was lost in the vast explosion of war. Beardall, W., 'Exploration of the Rufiji,' Proc. R. Geog. Soc., 188I, pp. 640ff. Bell, R. M., 'The Majimaji Rebellion in the Liwale District,' Tanganyika N . R., No. 28 (1950), pp. 38-57. Burton, Sir R. F., The Lake Regions of Central Africa , Vol. I.
Driberg, J. H., 'Yakan,' J. R. Anthrop. Inst., Vol. LXI (193I), 413-20. Sayers, G. F., Handbook of Tanganyika (1930). Scheerder and Tastevin, Revd. Fathers, 'Les Wa lu guru,' Anthropos,Vol. XLV, Parts I-3, pp. 241ff. Stockley, G. M., 'The Geology of the Rufiji District,' Tanganyika N. & R., No. i6, pp. 21-24. Von Prince, T., Gegen Araber und Negern.